The Beano has entertained kids since 1938, and nearly 80 years on, it’s still jumping with jokes, loaded with laughs and packed with pranks! Targeting 7-11 year olds, it needs to continually engage with new audiences to retain it’s status as Britain’s favourite comic. With thousands of children travelling with them over the summer holidays, DFDS were keen to find new ways to keep their younger passengers entertained on their journey. The ferry operator could easily have produced their own activity pack that would have kept younger members of the family entertained. But with the Beano on board, the family entertainment reached a whole new level. 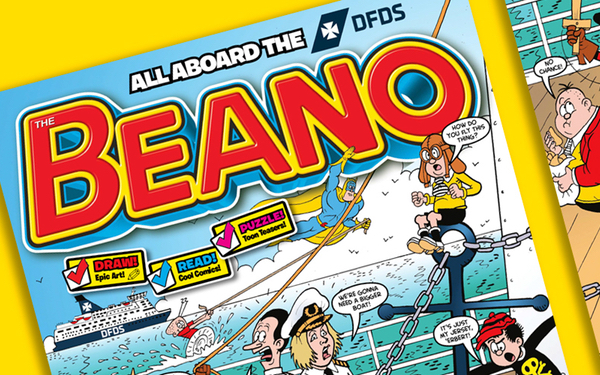 The Beano created a bespoke travel themed special edition of the comic for DFDS to distribute on board the ships. The comic saw Beanotown’s characters causing mischief and mayhem as they sailed away on their holidays. To bring the experience to life, Dennis the Menace came on board for a photo shoot, the children’s play area was ‘Beanofied’, a Beano themed treasure hunt was created on board, guiding families to key areas on the ships, whilst a Beano illustrator was on board for a day to teach a group of school children how to draw their favourite Beano characters. The extra value delivered by the quality of the Beano content, plus the magic factor introduced by parents’ own fond memories of the cherished comic and its characters, meant the activity packed more punch than if DFDS had simply produced something themselves. And the Beano were able to distribute 120,000 chances to influence young reader’s comic buying preferences, with each copy offering a fantastic subscription offer for readers.